Are you a beginning runner? Already a runner? Haven’t run in a long time? Either way, you can finish a marathon. Learning some of the basics will help you get started. Finish time goals, weight loss goals, “just finish” goals…we all have a reason(s) for wanting to run a marathon. If your only goal is to lose weight, good luck. You’re likely to quit. You are likely to quit just like so many people who join health clubs each year for the same reason only to stop going after seeing little results in little time. You must have the right goals and reasons for running in order to be successful. Treat your feet to a good pair of running shoes (or three!). Running shoes will be the most important piece of gear. Shoes are designed to fit feet with different arches, pronation, and more. Visit a local specialty running store to find the best shoes for your feet. Carbohydrates provide the fuel runners need. During marathon training, 65% of your total calories should come from carbohydrates, particularly complex carbohydrates. 10% should come from protein (you need 0.5 to 0.7 grams per pound of your body weight each day). 20-25% of your total calories should come from unsaturated fats. Be sure to get the nutrition you need to keep you strong and allow for adequate recovery. On runs of an hour or more, carry fluids with you and consume 6-8 oz. every 20 minutes. During pre-training and marathon training, weigh yourself before and after each run to rehydrate and get your body weight back to the weight it was before the run by drinking water or sports drink within the first hours after the run. Use your non-running days to rest and recover. Ice down any soreness, particularly in knees or shins (most common) four times per day for 15-20 minutes. Injuries often sneak up without warning. Doing all the right things right will minimize your chances of injury. Before you begin marathon training, you should be able to run for at least 30 minutes without stopping. Distance is not important right now. You just need to get your body used to running. Combinations of run/walks are great to use during pre-training because they ease your body into the exercise and minimizes the chance of experiencing a running injury. It’s also a good idea at this point to go ahead and select a marathon and get signed up! Your mileage should gradually increase each week with your longest run being 18-20 miles. You should then taper off in the final weeks leading up to the marathon to allow your body to recover from training and so you will be strong on marathon day. Having a 20-mile run under your belt will give you a major psychological advantage on marathon day. 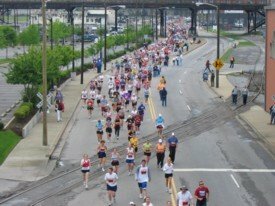 Following is a suggested beginner marathon training schedule. The schedule assumes you have been running for at least 6-10 weeks at can run for at least 30 minutes without stopping (See 26-week schedule). Tapering in the final weeks before the marathon will help your body recover from marathon training and be strong for your big day. You will also want to carbo-load the week leading up to the race. 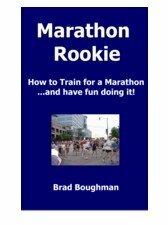 Given the atmosphere at most marathons, you will likely feel full of adrenaline after leaving the starting line. Remember though, marathons are about endurance and pace is critical. Maintain pace to save everything you have left for your big finish!